The common challenges faced by the project partners are lack of cross-border cooperation in combating cross-border crime and ensuring public security, where Latvia and Lithuania are used as transit areas for further crime moving to Europe. The project shall address strengthening of police cross-border cooperation in the field of handling of service dogs (K9) that are used for detention of dangerous persons, search of prohibited substances, material evidences, missing persons and other. 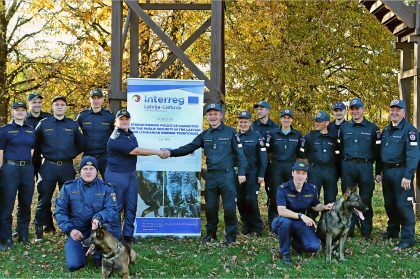 Its overall objective is strengthening of the Police K9 capabilities for the public security in the Latvian and Lithuanian border territories. It will strengthen competences and capacities of Police K9 staff and partner institutions. During the project experience exchange visits, theoretical and practical trainings will be organised for more than 40 officers, and training equipment as well as two specially equipted minibuses for dog training centers in Latvia and Lithuania will be purchased. Also, partners will develop Joint Police K9 Training Strategy and draft Guidelines (including action plan) in the field of dog handling. 10 service dogs, special equipment for service dogs and handlers, and six specialised police cars for handling of dogs will be purchased and stationed in the Programme territory. As a result of the project, number of police service dogs and dog handlers will be increased, as well as K9 mobility and cross-border response capacity to combat crime and to improve civil security in Zemgale, Latgale, Kurzeme, Kaunas, Utena, Šiauliai, Klaipėda, Telšiai and Panevežys regions. On 21th-23th November Experience exchange visit to the State Police of Latvia and State Police College took place in Riga, Latvia. 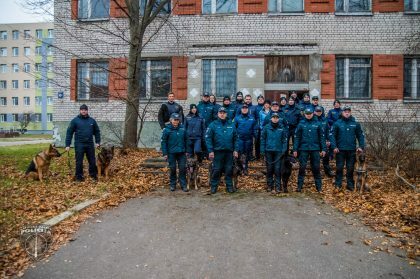 On 10th-12th October Experience exchange visit to the Lithuanian Police Forensic Science Centre Dog Training Board took place in Vilnius, Lithuania. On 14th-15th June Kick-off meeting and 1st Press conference of the project “Police K9” took place in Jelgava, Latvia.